Vanilla pods are the fruit of the vanilla planifolia, the only orchid to produce an edible substance. Vanilla pods are long, thin and filled with beans that are virtually flavorless in their unripened state. The pods must be cured for several months until vanillin crystals are emitted. The fragrance from the vanillin permeates the inside of the pod which eventually turns dark brown. The beans are then scraped from the inside of the pod and are ready for use. The three most common type of beans are the Bourbon-Madagascar (thin and sweet), the Mexican (thick and rich) and the Tahitian (the thickest, but least flavorful). Be aware that some Mexican vanilla products contain coumarin, a blood- thinning drug with possible toxic effects. Don’t be frightened by this fact, but do buy your vanilla from a reputable source. 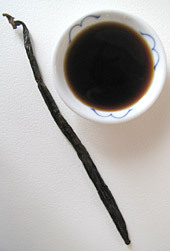 Pure vanilla extract is prepared by steeping cured vanilla beans in alcohol. Pure extract shouldn’t be confused with imitation vanilla extract which is man-made and much harsher. Pure vanilla extract is about twice the price of imitation, but is well worth the money. Vanilla beans are often used in ice cream and sauces. Vanilla extract is commonly used in baking, especially in sweets, as it heightens the intensity of chocolate and other flavors. Extracts can be stored in an airtight container indefinitely if kept in a cool, dark place. Vanilla beans should be tightly wrapped in plastic wrap, in an airtight jar and refrigerated. They will keep well for about 6 months. This entry was posted on Saturday, November 3rd, 2007 at 7:03 am	and is filed under Encylopedia, Herbs & Spices. You can follow any responses to this entry through the RSS 2.0 feed. You can leave a response, or trackback from your own site.